I hope you are all doing well and for my fellow commuters, I hope you are enjoying this beautiful driving weather! I know that we are slowly but surely getting further into our fall semester… but to me it still feels like we just started! I think that is why I am having such a tough time getting adjusted to waking up early and being prepared for my day earlier than I normally would. That being said, one of the most important lessons that I have learned is that it is absolutely crucial to pack a bag of food one night in advance! For some people, like my sister, packing a lunch the night before her class is just a force of habit. I, on the other hand, have not had the same luck. For those who relate to me, I think I may have some tips to make this chore seem a little more enjoyable! First, I suggest that you create a solid playlist. This makes the time go faster and can also make paking your food more fun! Next, think about the foods you have available to you and then consider which foods you typically crave most throughout the day. These are usually the foods you want to bring with you. I always say that it is better to have it and not need it than to not have it at all! Another great tip when packing your food is to have a variety of options in your bag. For example, I like to pack a fruit, something crunchy, something sweet, and something that will fill me up! I also try to throw in a few things that I can eat while driving! These are foods like granola bars or trail mix. This way, I know I am prepared for anything! 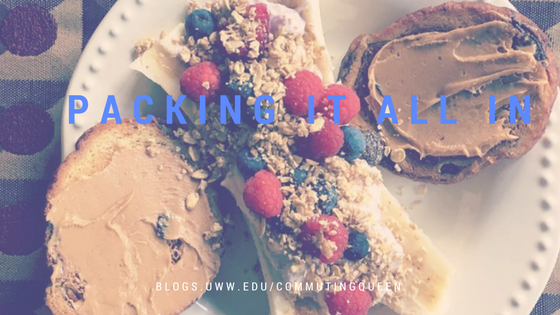 Packing a lunch one night in advance may seem like a lot of work but I hope that my tips will help lighten the load of this task at least a little bit! This entry was posted in Preparation and tagged commuter, food, prepared, tips, tricks. Bookmark the permalink.